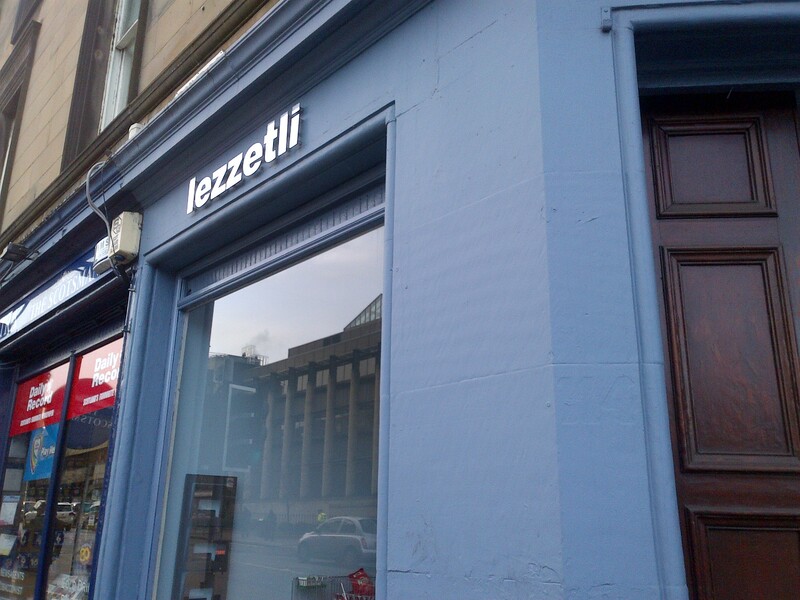 I’ve been meaning to visit Lezzetli for some time now, and indeed made it half way there, back in May, before being waylaid by the charms of French Press. Having passed on my travels again, recently, I redoubled my determination to finally get there. My main challenge, once more, was getting there without being diverted by another one of their competitors, as their Dundas Street shop sits alongside half a dozen other sandwich shops that tend to the lunchtime needs of a number of busy nearby offices. But I digress. While there is a clear influence from that part of the world, the menu covers most of the basics you’d expect from any sandwich shop, with rolls, wraps, paninis, soups, salads, and daily special main dishes. 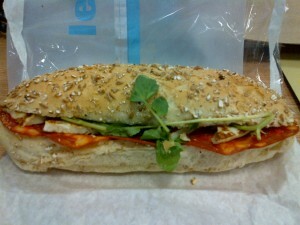 From their selection of ready-made rolls, I spotted a chorizo, grilled haloumi and watercress one that looked just the thing. 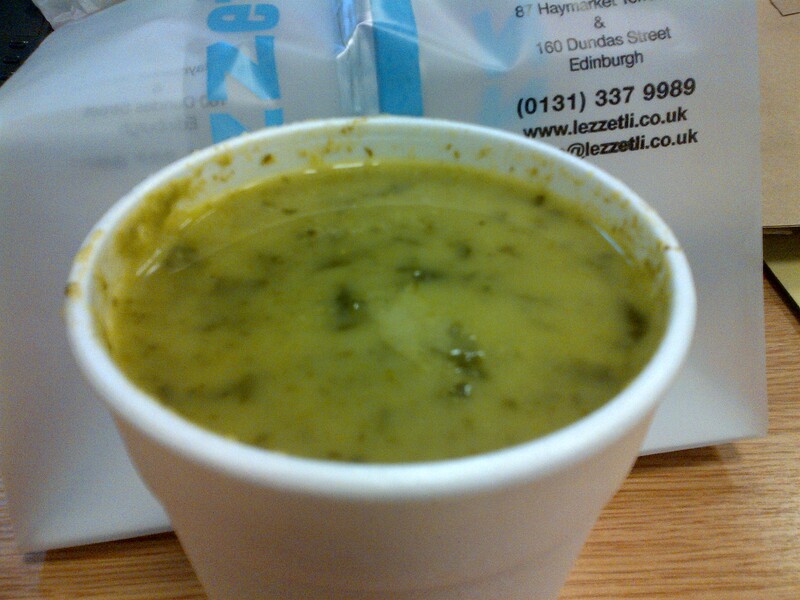 Their soup of the day was cream of spinach, so I ordered a large one of those. With my payment having been quickly attended to by the friendly counter staff, I was soon on my way back up the road. The day prior to this review, I’d had a really poor dining experience in Strada, where the soup was bland and the risotto rather curious. I can confidently say that a single bite from each of the items that Lezzetli offered had more flavour in them that the collective dishes that Strada presented. 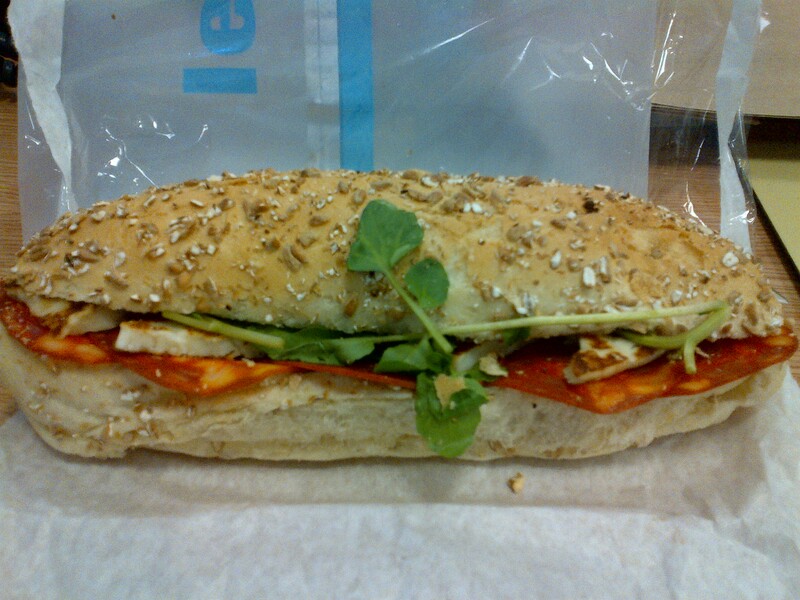 The roll was very good, with a nicely fresh, cracked wheat roll filled with lovely watercress, good chorizo, and well-toasted haloumi. I was pleased with it. The soup was completely triumphant, and becomes the 15th member of the “exceptional” category on Soupquest. Packed with Popeye goodness, this deeply green soup was quite spectacularly flavourful, with a lovely lingering note of cracked black pepper. I could have happily spooned my way through several bowls of the stuff. So I was delighted with Lezzetli. The soup was absolutely first rate, and the roll was really rather good, too. Once I’ve had a chance to explore the half a dozen wee places, nearby, I look forward to popping back here to sample more of their soupy delights. I suggest you pay them a visit, soon, as what they have on offer is really high quality.